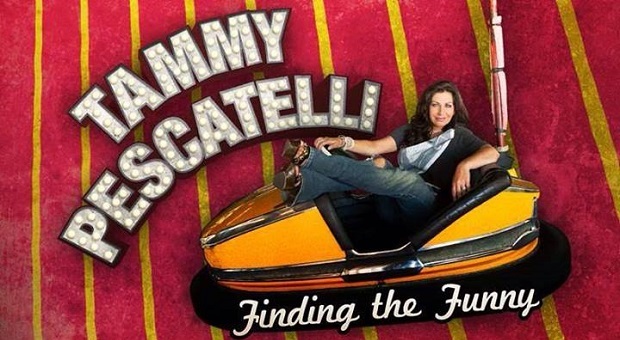 This week, Angie puts a spotlight on Tammy Pescatelli’s comedy career. If you or your comedy troupe would like to be featured on Stand-Up Tuesdays, please email utgjames@gmail.com. If I were to pen a letter to the comedy gods asking for a customized female comedian whose material I could not only relate to, but want to surround myself with constantly, I would settle for nothing less than Tammy Pescatelli in response. With the release of Pescatelli’s new special, Finding the Funny via New Wave Dynamics last week, it’s safe to say I’ve found my new favorite comic. Pescatelli is a wildly charismatic performer who uses her stage time wisely: from start to finish, Finding the Funny feels like Pescatelli’s audience are gathered around a bar table, reveling in the fresh and sharp manner in which the comic tells her stories. Her stage presence is warm and welcoming, giving off the feeling that Tammy isn’t just a comedian, but an old friend who knows just what makes you laugh. Now, I’m not going to lie – one of my favorite aspects of Pescatelli is just how much she kills herself along with her audience, often letting out a loud and genuine guffaw that is purely infectious. If you weren’t, for some reason, already cracking up, you won’t be able to resist once Tammy starts laughing – once again adding to the intimate environment she creates in “Finding the Funny”. It’s been a consistently awesome stretch lately here in Stand Up Tuesdays, and Pescatelli certainly is no exception. Finding the Funny is one of the strongest specials I’ve had the pleasure of reviewing, offering exceptionally high-quality comedic entertainment that will certainly be hard to match (well, until the next Tammy Pescatelli special, that is). Check it out today on Netflix and grab your own copy while the gettin’s good!